Arnold Schwarzenegger and girlfriend Heather Milligan. Here to stay? The fitness-obsessed twosome have enjoyed swanning around Beverly Hills as Arnold Schwarzenegger celebrates 33 years as an American citizen. The former politician seems to have a new lease of life. I wonder if this can be attributed to his young 41-year-old former gymnast girlfriend Heather. 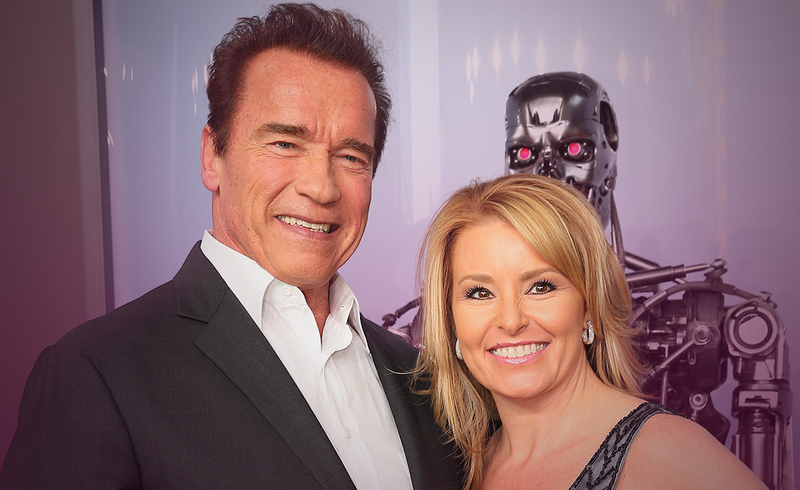 She’s been with her age-defying 69-year-old terminator boyfriend since 2012. Arnie has four children with Maria Shriver; Patrick, Christina, Katherine, and Christopher. He secretly fathered love child Joseph with their former housekeeper which led to the end of his 25-year marriage to Maria. Arnold recently sought guidance from Donald Trump, Republican presidential nominee as he is due to host the 15th season of The Celebrity Apprentice. It’s premier being January 2nd 2017. He’s clearly enjoying a new lease of life proving that you’re never too old for… just about anything. Arnold drew the World, the Emperor and the Queen of Hearts. Could Arnold Schwarzenegger embrace the love any more right now? The World is symbolic of an outstretched hand, evolved from the stars and materialized into reality. Arnold is master of his own mind and continues to be the creator of his own reality and I don’t see this ceasing anytime soon. The Emperor is very much Arnie. He has achieved many goals in his life and has nothing further to prove to himself. There continues to be an ambition within him and he will engage in projects of a more innovative quality with dedication and compassion. His leadership will come forth as he takes charge using balanced, reasoned power in achieving what he needs whilst convincing others to assist in maintaining his position. The Queen of Hearts is very much the strong lady behind the successful man. There is a strong emotional connection between Arnold and his loved one’s, especially within his current love relationship that continues to grow and thrive. Both Arnold and Heather understand that the couple who play together, stay together and there is a closeness between them that they will build on. I feel that Arnold and Heather will continue to give to each other without expectation. This will enable independence within their relationship. Previous ArticleDid NASA just change your Birth-sign?Next ArticleHow did Adrienne Bailon get dragged into it?